Anesthesia Consultants Medical Group, P.C. 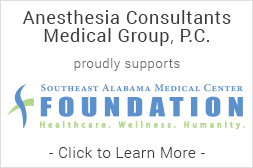 (ACMG) is a professional group of physicians who are engaged in the practice of perioperative medicine, anesthesia services and acute and chronic pain management in the Wiregrass region. Our practice locations include Southeast Alabama Medical Center, The Women’s Center, Dothan Surgery Center, and South Alabama Outpatient services in Enterprise, Alabama. ACMG physicians work in conjunction with certified registered nurse anesthetists (CRNAs) in an anesthesia care team model. We are dedicated to the highest level of care and concern for our patients and their families, the best service for our physician colleagues, and sincere community involvement for the betterment of our society. Copyright © 2014 Anesthesia Consultants Medical Group, P.C. | We proudly support the SAMC Foundation. | Website by Strategy6.